About Post : Madhya Pradesh Professional Examination Board Announced New Vacancy application for Middle School Teacher Eligibility Test Post. This advertisement has total 5670 posts for Middle School Teacher Eligibility Test Post . 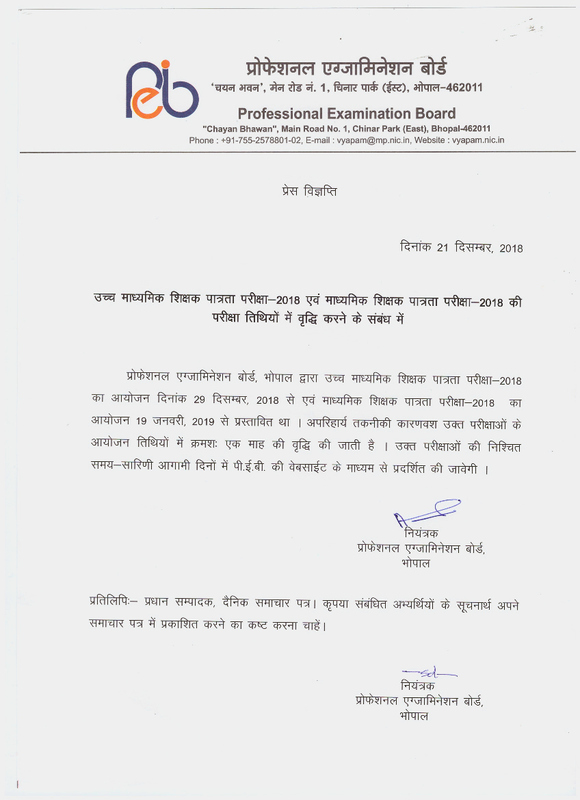 According to the recently published Madhya Pradesh Professional Examination Board advertisement Qualified candidates can apply before the last date 20/10/2018. In this portal you will get the posts related to the Madhya Pradesh Professional Examination Board and the post of Middle School Teacher Eligibility Test Information will continue. The related educational qualification, post-information, age limit and other information given on this post MP Middle School TET Answer Key 2019. Gen/Other State : 570/– Rs. Bachelor Degree in Related Subject with Minimum 50% Marks and B.Ed Exam Passed. Bachelor Degree in Related Subject with 2 Year Diploma in Elementary Education. Bachelor Degree in Related Subject with 45% Marks and B.Ed Degree (As per NCTE Guidelines). 10+2 Intermediate 50% with 4 Year Diploma in BLEd. Here, we have provided all the required details of Madhya Pradesh Professional Examination Board Recruitment, Vacancy Details, Exam Dates, Eligibility Criteria, Exam Pattern, Syllabus, How to Apply Online, Application Fee, etc. Therefore, candidates are suggested to read the full article to know brief information about Madhya Pradesh Professional Examination Board 2018 and MP Middle School Teacher Eligibility Test Answer Key 2019 If there is any question related to the suggestion, please comment below.